As a restaurant owner, you’re tasked with a multitude of mission-critical responsibilities including managing your staff, keeping customers happy, organizing inventory, keeping the restaurant clean, building a reputation in the local community, and more. No matter how busy you get, you still have to find time to increase your per table ticket sales and bring more guests. To help get you started on the right foot, we put together this list of quick and easy marketing ideas for attracting more customers. Follow these quick and easy marketing tips to make your restaurant sizzle. In most cases, the following restaurant marketing ideas can be implemented in less than 30 minutes — it’s that easy! The human element is a major component of any successful marketing campaign. People don’t buy from businesses, they buy from people. This is especially true for restaurants. People love to be served by joyful workers. When diners are going out to eat they are looking to have an experience that’s more than just feeding their bellies. Your team is a major component. Snap photos of your chefs preparing meals. Take a quick picture of a hostess opening the door. Show a server delivering food to a table. You can even show your bus staff cleaning tables. You can share these photos out on a variety of different channels. From social media to text messages, your photos will help build a deeper connection with your customers and your staff. When someone is looking to come to your restaurant for the first time, the biggest thing they are concerned about is the food that you have to offer. It's important that you have your menu available online for people to view. If you don't, many of your other strategies are basically useless. They will skip over you and move on to the next search result. 80% of consumers want to see a menu before they dine at a restaurant. 70% of consumers think that it’s important to be able to read a restaurant menu on a mobile device. 62% of consumers are less likely to choose a restaurant if they can’t read the menu on their mobile device. If you're not sure how to get started publishing your menu online, then take a look at Open Menu. They can help you get your menu looking great online. Their software even offers some social integration to help boost your menu’s reach. SMS marketing is easy to use and fast to get started with. This makes it perfect for running a contest. Unlike the typical fishbowl contest that you will see in a lot of restaurants, SMS contests do not require a user to have a business card to be able to enter to win. Customers can simply pull out their smartphone and send a quick text message to your shortcode and entered to win the prize. The prize that you give away can vary. It could be something as simple as a free dessert or as big as a lunch for the winner and three of their best friends. Plus, you are also building a list of subscribers that you can use for future SMS promotions. Social media marketing is important for a restaurant. Your customers are hanging out on a variety of different channels, and you need to be there with them. To get started, set yourself a regular social posting schedule. Take a few minutes and jot down which days of the week and times of the day that you want to post on. Now, make a list of inspiration for posts. You could share photos of your staff members, your food, daily specials, repeat customers, events, and so much more. Set reminders on your calendar or use tools like Hootsuite to schedule your posts in advance. Posting regularly will help you build an audience of loyal fans that are engaged and more likely to come to visit your restaurant. Responding to reviews should definitely be a part of your marketing strategy. It's important to respond to both negative and positive reviews. According to Vendesta today, 95% of customers will return if you quickly and efficiently address complaints. On top of that, a number of studies show that most customers will delete a negative review if you were able to resolve their issues. Buzztime has a great 5A Formula to help you respond to negative reviews. Someone with authority should be responding to reviews. It’s important that they acknowledge the customer’s pain. The manager should take action to make things better. Show the reviewer how you’ll make amends. Finally, give your customers a chance to edit or take down their reviews by asking how you can make things better. Future customers are reading these reviews, so it’s important for you to spend time demonstrating that you care about the experience customers have in your restaurant. If you are already posting on Facebook, then you can leverage Facebook’s publishing tools to identify your top 5 posts. You are looking for ones that have been liked, shared, or commented on. Pick the most recent one of the top five and use a paid boost to get it in front of more people. People are more likely to engage with posts that are already popular, so this is a great strategy for taking a post that is already performing well and getting it seen by new people. Studies show that reducing customer churn by as little as 5% can increase your profitability from 25% to 125%. So, don’t take your regular customers for granted. Take a minute and look around your restaurant. Speak to your servers. Find out who your regular customers are and then surprise them. You could give them their drinks for free, ask them if they’d like a desert on the house, or surprise them with a $5 gift certificate for their next visit. Doing something this simple helps retain their loyal customers. They are also more likely to tell others about their experience. As a restaurant owner, you have a lot of competition, and it’s more important than ever before to build a loyal customer base and attract new people. SMS marketing is a great way to reclaim your connection with your customers. You can build and maintain relationships with your diners whether they eat in, take out, or have it delivered conveniently to their door. Thanks to the personalization and immediacy of texting, your restaurant can deploy a wide variety of strategies with better results than traditional channels like email or social media. Being able to send offers and coupons quickly and easily is just the beginning. 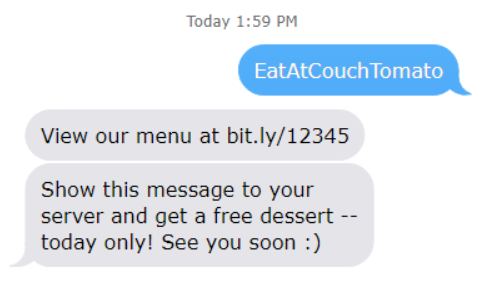 At EZ Texting, we have helped hundreds of restaurants utilize SMS marketing to deliver game-changing results and build strong relationships with their customers. We have combined that knowledge into a powerful playbook full of strategies that you can take and implement right away. Download your copy and get started today.